Whyte System Type: 4-4-0 "American"
Remarks: Mechanically this is a tired, worn-out engine, but one that is very valuable for stationary exhibit purposes. History: Incorporated on July 1, 1862, the Union Pacific Railroad constructed the eastern half of the nation's first transcontinental railroad during the 1860s, its main line extending from Omaha, Nebraska, westward to Promontory Summit, Utah, (later cut back to Ogden, Utah) by May 1869. Subsequently the Union Pacific took over the Utah Central extending south through Salt Lake City, and the Utah & Northern, extending from Ogden through Idaho into Montana, and it built or absorbed local lines, which gave it access to Denver and to Portland, Oregon, and the Pacific Northwest. It also acquired the Kansas Pacific (originally called the Union Pacific, Eastern Division, though in essence a separate railroad), and until forced to divest it to the Colorado & Southern Railway by reason of bankruptcy during the 1890s, it owned narrow gauge trackage into the heart of the Colorado Rockies and a standard gauge line south from Denver across New Mexico into Texas. The railroad's early troubles led to bankruptcy during the 1870s, the result of which was reorganization of the Union Pacific Railroad as the Union Pacific Railway on January 24, 1880. It was this second company that purchased Locomotive No. 737, but that company, too, entered bankruptcy in the 1890s from which it emerged on July 1, 1897, reverting again to the original name, Union Pacific Railroad. Such minor changes in corporate titles were a common result of reorganization after bankruptcy among American railroads, but the terms "railroad" and "railway," while interchangeable in common usage, are not interchangeable in the proper title of a company, and generally designate a specific and definable period in that company's history. It was during a surge of expansion in the late 1880s preceding the bankruptcy of the 1890s that the Union Pacific acquired diamond-stacked locomotive No. 737. 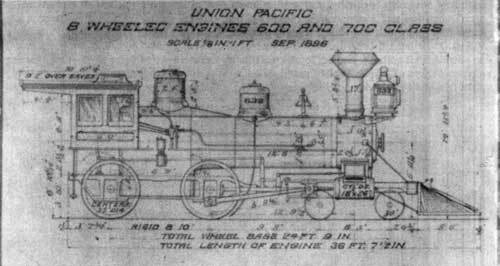 The original appearance of Union Pacific Railway Engine No. 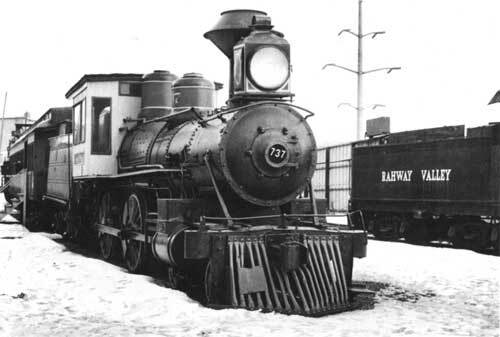 737, as shown in an enlargement of a section of a photo of an official inspection train out on the line around 1890, differed considerably from that resulting from the misguided "restoration" by the Steamtown Foundation about 1969. During the 19th century, the 4-4-0 was the most common type of American locomotive, so common that the type came to be called the "American Standard," or, to be briefer, simply the "American." Thousands of these locomotives rolled out of the erecting shops of America's locomotive builders. At mid-century, and at the time of the Civil War during the 1860s when the Union Pacific was just getting organized, the American-type locomotive was not only the passenger engine on America's railroads but also the freight engine, although by the 1860s and 1870s, 2-6-0 and 2-8-0 types were beginning to supplant it in main line freight service. Nevertheless, the American type continued to hold its dominance in passenger traffic until nearly the end of the century, when heavier and larger 4-6-0 "ten-wheelers" and eventually other types replaced the American on main line passenger trains. Increasingly, as time passed, 4-4-0 locomotives found themselves downgraded to branch line and short line service, where they continued to serve in ever-diminishing numbers until the middle of the 20th century, and some even came into the ownership of industrial concerns such as logging firms and sugar cane plantations. 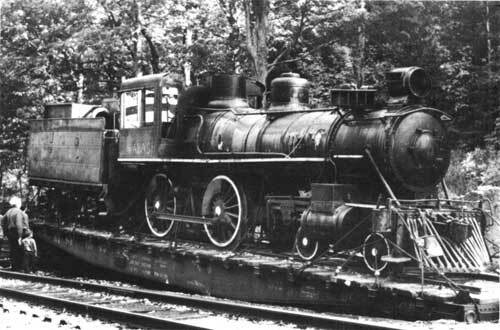 The 4-4-0 thus is a prime example of an engine that started out as a mainstay of main line passenger traffic (and, briefly, freight) on the nation's major railroad systems, but that by the 20th century had been replaced by heavier power and had been shunted aside to the branch line mixed trains as well as to use on lumber, mining, and other industrial railroads. Thus one era's main line motive power became a later era's secondary or branch line motive power. Of the thousands and thousands of these locomotives built in America, only about 39 examples of the 4-4-0 American survive in the United States. Fittingly, Union Pacific Railway Engine No. 737, the oldest locomotive in the Steamtown collection used in the United States, began its career in 1887 as part of one of the largest locomotive orders on record up to that date, for use on Union Pacific passenger and freight trains. 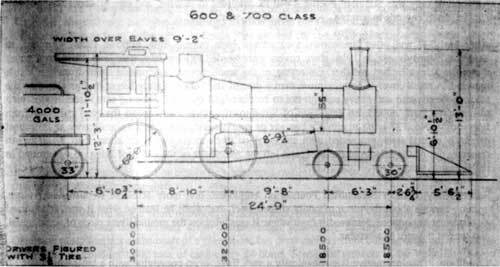 As delivered, the locomotive had a long, pointed, vertical bar wooden pilot, an oil "box" headlight, a "diamond" stack of the shallow diamond style peculiar to the Union Pacific at that period, and steam and sand domes that appeared comparatively square in profile and lacked the common, ornate, cast-iron dome "rings," a decorative molding that dressed up the appearance of such domes and that many 19th century locomotives sported. Upon entering service, the locomotive reportedly had the initials "O.& R.V." painted on the small panel below the windows on each side of the cab, standing for the name of a Union Pacific subsidiary in Nebraska, the Omaha & Republican Valley Railroad. Later the locomotive had "Union Pacific" spelled out in small letters on each side of the cab, probably in white, and a large white "737" on each side of its black tender. In August 1904 (different sources disagree on the date), the Union Pacific, since July 1897 again a "Railroad," sold Locomotive No. 737 and a few similar 4-4-0s to either Morgan's Louisiana and Texas Railroad and Steamship Company or the Texas and New Orleans Railroad, both of them components of the Southern Pacific System. A Union Pacific Railroad folio locomotive diagram book issued in 1911 showed engines of this class as having had their diamond stacks replaced with straight or "shotgun" stacks, but whether that change had been made before the sale of Locomotive No. 737 is not known. By the time it purchased Locomotive No. 737, the Southern Pacific Company had grown into a major railroad system that incorporated many smaller companies, such as the Texas and New Orleans and Morgan's Louisiana and Texas, and that extended from New Orleans through Texas to El Paso, across New Mexico and through Tucson, Arizona, to Los Angeles, throughout most of California including San Francisco and Sacramento; it absorbed the Central Pacific extending eastward across Nevada to Ogden, and had lines reaching north throughout and across Oregon to Portland. Developed by the same Big Four California entrepreneurs who had built the Central Pacific--Leland Stanford, Collis P. Huntington, Mark Hopkins, and Charles Crocker--the Southern Pacific became their tool for expansion beyond the original Central Pacific, which one might have expected to grow instead, but the Southern Pacific corporate structure proved more amenable to their needs than that of the Central Pacific. Thus the historic Central Pacific slowly vanished into the corporate structure of the Southern Pacific as the original developers of the system passed one by one from the economic scene. Union Pacific Railroad Folio Locomotive Diagram Book No. 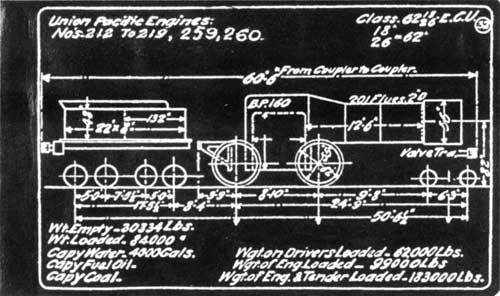 200, issued in 1897, showed the original appearance and vital statistics of locomotives such as No. 737. Note the squared profile of the domes on this engine. Although the Union Pacific Railroad and the Southern (Central) Pacific jointly operated the first transcontinental railroad, elsewhere they competed bitterly throughout their history, and only briefly around the turn of the century did they come under the same ownership, that of Edward Henry Harriman. It was during Harriman's comparatively brief period in control of both systems that Locomotive No. 737 and some of her sisters migrated southward about 1904 to the Texas and Louisiana lines of the Southern Pacific System, such as the Galveston, Harrisburg and San Antonio Railway, the Texas and New Orleans Railroad, and Morgan's Louisiana and Texas Railroad and Steamship Company. According to one source, No. 737 became No. 246, lettered "Morgan's Louisiana and Texas." Other sources suggest that it became a Texas and New Orleans Railroad locomotive. The Southern Pacific Company owned or controlled both of these Texas-Louisiana railroads, but the question of which subsidiary owned No. 216 is not unimportant, because it would have determined how the locomotive was lettered. In 1913, in a renumbering and reorganization of motive power, the Southern Pacific Company gave the locomotive its final number: No. 246 became No. 216. During the first quarter of the 20th century the owning railroads made a number of important modifications to Engine 246, later 216. By the end of 1904, subsequent to Congress passing a safety act that mandated the change, the Southern Pacific converted the locomotive's link and pin coupling equipment to automatic "knuckle" couplers, possibly of the Janney type. At unknown dates, a number of other changes followed. 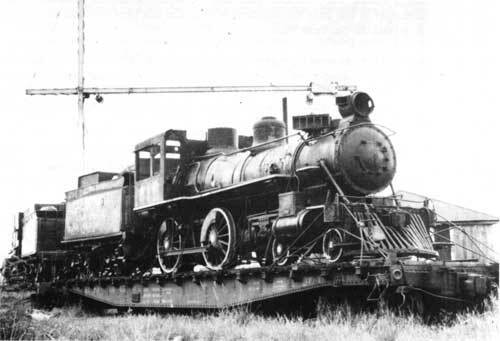 While some of the modification may have occurred before the locomotive left the Union Pacific, such as change out of the couplers and replacement of the diamond stack by a straight or shotgun stack, it was probably on the Southern Pacific lines that the locomotive soon experienced further alteration in the form of modernization quite common on railroads across the country during the first two and a half decades of the 20th century. Mechanics and boilermakers replaced the original short smokebox with an extended smokebox with shotgun stack, and it was almost certainly on the Southern Pacific Lines that the shops converted the locomotive from a coal burner to an oil burner by installing an oil tank in the tender in place of the coal bin and rigging connecting hoses and pipes to feed oil to the firebox, with suitable controls and probably modification of the firebox grates. Thus the locomotive could exploit Texas and Louisiana petroleum for fuel. A steel pipe or "boiler tube" pilot replaced the original wooden type of cowcatcher. An all-steel cab replaced the original Baldwin wooden cab. A new and different headlight replaced the old kerosene "box" headlight. After its acquisition of Union Pacific No. 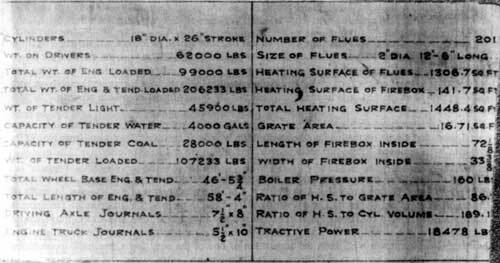 737, at an unknown date probably during the 1920s, Southern Pacific Lines prepared its own locomotive diagram sheet for the locomotives it had acquired from the Union Pacific No. 737 had become No. 216 in this series. In 1913, the Southern Pacific System gave the locomotive its final number in yet another renumbering of motive power. No. 246 became No. 216. At the time, the locomotive probably was lettered "Southern Pacific Lines" in large white letters on her tender, with the number on the cab and the small initials to indicate the actual Southern Pacific subsidiary that owned her. Several variant lettering schemes succeeded each other in Southern Pacific practice. It was not until December 4, 1929, that Locomotive No. 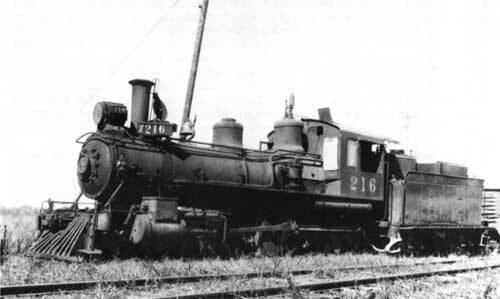 216 retired from active service on a major railroad system; on that date, the Southern Pacific Company sold her to the Erath Sugar Company for industrial use in the canefields of Louisiana. The Erath and Vermilion sugar factories, located in Vermilion Parish, Louisiana, at Erath and Abbeville, respectively, had been established in 1909 when the Caldwell and Moresi brothers entered a partnership to process sugar cane. At Erath, they erected for the 1910 grinding a large new factory with a cane-grinding capacity exceeding that of most other mills in the state. Knowledgeable entrepreneurs in the sugar cane industry regarded the Erath mill as one of the most modern plants in the sugar district, a large factory supplied by more than 1,200 outside growers, the company itself owning only 1,000 acres of land. Extending out from the factory, 17 miles of railroad reached into the canefields to 16 loading stations. The company not only had purchased Southern Pacific Locomotive No. 216, but later acquired Southern Pacific (T.& N.O.) No. 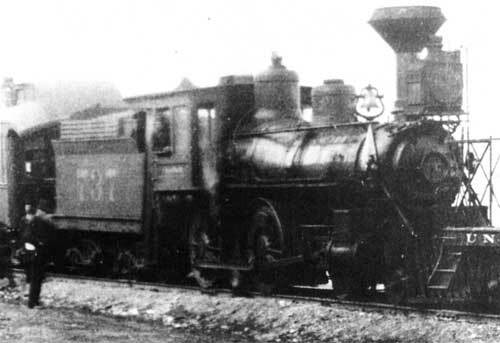 319, a Cooke-built 4-6-0 outshopped in 1892. The company owned no gondola cars of its own, using cars owned and supplied by the Southern Pacific. In August 1947, the Erath Sugar Company sold or otherwise transferred ownership of No. 216 to the Vermilion Sugar Company at Abbeville, Louisiana. On Vermilion Bayou in the heart of Abbeville, Louisiana, parish seat of Vermilion Parish, the same pair of brothers had built another major central sugar processing factory. This Vermilion Sugar Company plant was not at the heart of a plantation, but drew entirely from outside cane growers to fill its capacity of grinding 1,400 tons of cane every 24 hours. Some 800 growers in the Vermilion Bayou region supplied it with cane, much of it moving to the mill by 18 100-ton barges and one towboat that negotiated Vermilion Bayou as far as 30 miles. The remaining cane came to the mill on the Abbeville Branch of the Southern Pacific. The Vermilion plant had one steam locomotive to handle switching to the weighing scales and to and from the Southern Pacific, and this generally was another Cooke 1892 4-6-0 purchased from the Southern Pacific. In practice, the three locomotives were used interchangeably between the two mills, so that No. 216 worked the Vermilion plant trackage as well as that of the Erath plant. The sugar companies retained the locomotive's last Southern Pacific number, 216, and other than painting out the Southern Pacific lettering, probably made no other noticeable changes in the locomotive. The Vermilion Sugar Company retired No. 216 in 1956. Union Pacific Railway Engine No. 742, an identical sister of No. 737, showed the fireman's side of that class of engine in its original appearance (top). By 1947, at the Erath Sugar Company in Louisiana, No. 737, now No. 216, had an extended smokebox, shotgun stack, electric headlight, and "boiler tube" pilot, and had been converted from coal to oil fuel. F. Nelson Blount bought the engine for Steamtown in 1957. To move the locomotive to Vermont on a flat car, it proved necessary in meeting height clearance requirements to cut off the roof of the steel cab that had replaced the wooden cab early in the 20th century, but Steamtown retained the cab roof, and moved it to Bellows Falls and then to Scranton. It was in 1970, inspired by the excitement generated by the centennial of the first transcontinental railroad even though a year late, that the Steamtown Foundation undertook an ill-conceived attempt to "restore" the locomotive either to the appearance of an engine at Promontory Summit in 1869 or her original appearance of 1887--it is not clear which was the intention. Whichever, Don Marshall supplied a replica of a "diamond" stack that reflected neither the types of stacks present on engines in 1869 nor the types of stacks used on Engine No. 737 during the 1880s and 1890s. This replica was installed, as well as a box or kerosene headlight, and Bill Kimberly built a wooden cab cosmetically applied over the remaining walls of the Southern Pacific steel cab. Thus, No. 737 does not today represent any appearance she presented historically. As already mentioned, the oldest locomotive in the Steamtown collection, No. 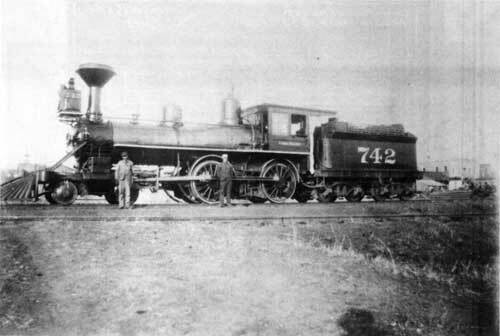 737 is the oldest genuine Union Pacific engine in existence and the only Union Pacific 4-4-0 in existence. It is one of 52 surviving Union Pacific steam locomotives. Considered as part of the entire Southern Pacific System, it is one of only five Southern Pacific 4-4-0 locomotives to survive, and one of about 65 Southern Pacific steam engines to survive. Locomotive No. 737 arrived at Steamtown in Vermont with some dismantled parts loaded in her tender, others more vulnerable to theft shipped separately. After No. 737 and other Steamtown locomotives were moved from Bellows Falls, Vermont, to Scranton, Pennsylvania, in 1984, stack covers were needed to keep rain, sleet, and snow from going down the stacks in bad weather, collecting in the smokeboxes, and rusting them from the inside outward. A stack cover is nothing more than a disc of steel plate slightly larger in diameter than the stack to be covered and heavy enough not to be dislodged by wind. Seeking scrap steel from which to cut some stack covers, an employee of Steamtown unfortunately found the steel cab roof from Locomotive No. 737 lying in either a box car or gondola and, attaching no significance to this sheet of gently curved steel, proceeded with an acetylene torch to cut two discs about 2 to 2 1/2 feet in diameter out of the middle of the roof, and left the remainder of the cab roof lying on the ground in the Scranton yard. Subsequently, another Steamtown Foundation employee, one more sensitive to historical values, became curious about the piece of oddly shaped steel, and when he learned what it was, recognized its historical importance, retrieved it from where it was lying on the ground like a piece of scrap metal, and locked it away in a boxcar. Condition: This locomotive is mechanically a very tired, worn-out engine with a lap-seam boiler. It is missing both boiler lagging and boiler jacket, and has a rotten wooden pilot beam and a rotten wooden tender frame. The steel roof was cut off its metal cab, although part of the walls may remain. They have been covered by a wooden cab of nonhistoric character and design. The engine has a phony "diamond" stack and a nonhistoric box or kerosene headlight, all applied in a misguided attempt to restore a semblance of 19th century appearance. The engine probably is not operable, and probably is suited only for static exhibit use. In preparation for shipment from Louisiana to Vermont, a crew of men removed the stack of Locomotive No. 737, removed the bell, removed the whistle and top of the steam dome, and cut off the top of the cabin roof, along with other minor work. W.T. Golson photographed the forlorn engine sitting on a Santa Fe flat car coupled with another car carrying another former sugar company engine to Vermont in September 1965. (1) The specific stack covers that were cut from this cab roof should be located and matched with the holes from which they were cut, and they should be labeled and locked up with the cab roof for future restoration. Eventually, the cab roof should be repaired not by overlapping patches of the holes, but by welding the stack covers back into their original position, with the welding ground smooth on both sides so that when painted, it is impossible to tell that the discs of steel ever were missing. (2) Substitute stack covers should be made from nonhistoric steel plate purchased from some scrap metal shop, and placed on the locomotive stacks from which the two stack covers cut from No. 737's cab roof were removed. These two recommendations are urgent and high priority. (3) An effort should be made to trade or exchange this locomotive for Delaware, Lackawanna & Western Railroad Engine No. 952, a Camelback 4-4-0C in the collection of the National Museum of Transport in St. Louis, Missouri. The advantage of this trade to the National Museum of Transport is that it would obtain an 1887 locomotive in exchange for a 1905 locomotive, and a locomotive whose significance to the Union Pacific and Southern Pacific Railroads already has been discussed. The advantage to Steamtown NHS is in the acquisition of one of the very few Camelback locomotives surviving, a type once common in Pennsylvania and the eastern United States, and more important, in acquiring the second surviving locomotive of the Delaware, Lackawanna & Western Railroad. Steamtown would thus bring Engine No. 952 back to its own territory, and Union Pacific No. 737 would migrate to the trans-Mississippi west in which it once operated. If the exchange is agreed to and sealed in a legal document, the National Museum of Transport should decide to what era No. 737, a.k.a. No. 246 and No. 216, should be restored. (4) If the National Museum of Transport rejects the proposal to exchange Union Pacific No. 737 for Delaware, Lackawanna & Western No. 952, then the National Park Service should restore the locomotive to its appearance during the 1920s prior to its sale by Southern Pacific Lines to the Erath Sugar Company in 1929, or to its appearance in 1947 on the Vermilion Sugar Company's track, which is documented by a photograph. As a first step, the NPS should commission a report, modeled on a report on Atchison, Topeka & Santa Fe Railway No. 1 prepared for the Kansas State Historical Society. The report should contain a thorough narrative history of the locomotive as well as exhibit the results of an exhaustive search for historic photographs of the locomotive, and photographs of sister locomotives, along with all pertinent documents obtainable from Baldwin records and from the records of the Union Pacific and Southern Pacific systems. The report should then recommend specifically what the appearance of the restored locomotive should be. It is believed on the basis of currently available evidence that the appearance of the locomotive at the time it was acquired by Steamtown in 1957 was essentially the same as that shown in the photograph made when it was on the Vermilion Sugar Company line in 1947, which was probably essentially the same as its appearance in the 1920s, except for paint and lettering. This restoration, in addition to requiring thorough cleaning of all rust including stripping of the present paint, would involve installing a new wooden pilot beam, a new wooden tender frame (unless some original members are salvageable), boiler lagging, and a new boiler jacket, removing the oil headlight and restoring the type of headlight used on the Southern Pacific (which may be in storage in the Steamtown collection), and restoring the "shotgun" stack (which may be beneath the added "diamond"). Other missing parts of the locomotive, some of which may be stored in the collections, should be restored to the engine. The physical restoration of the locomotive should include extreme care to ascertain original components and colors and to locate and preserve any specimens that might be Russia Iron jacketing on the cylinders; as the engine was stripped of its boiler jacket long ago, none is anticipated around the boiler, but some might still exist around the cylinders. The report should thoroughly investigate and research the various paint, lettering, and numbering schemes that the locomotive carried while on the Southern Pacific System, and it should then be painted, lettered, and numbered in a suitable Southern Pacific style, probably of the mid-1920s. Finally, the engine should be exhibited indoors as an example of a main line 19th century 4-4-0 at the end of its common carrier career as a 20th century branch line locomotive about to be sold to an industrial concern. A Union Pacific Railroad Folio Diagram Book as of September 23, 1911, illustrated 700-class locomotives as having had diamond stacks replaced with "shotgun" stacks, but whether this change occurred before the Union Pacific sold Locomotive No. 737 ca. 1901-1904 is not known at present. Beebe, Lucius. The Central Pacific and the Southern Pacific Railroads. Berkeley: Howell-North Books, 1963. Best, G.M. Locomotives of the Southern Pacific Company. Boston: Railway and Locomotive Historical Society, Inc., 1941: 30. Daggett, Smart. Chapters on the History of the Southern Pacific. New York: The Ronald Press Company, 1922. Diebert, Timothy S., and Joseph A. Strapac. Southern Pacific Steam Locomotive Compendium. Huntington Beach: Shade Tree Books, 1987: 357. Dunscomb, Guy L. A Century of Southern Pacific Steam Locomotives, 1862-1962. Modesto: published by the author, 1963: 16, 17, 19, 64. "Fuel Oil for Locomotives." Baldwin Locomotive Works Record of Recent Construction, No. 37. Philadelphia: Baldwin Locomotive Works, n.d.: 3-23. Kean, Randolph. The Railfan's Guide to Museum & Park Displays. Forty Fort: Harold E. Cox, Publisher, 1973: 175. Wilson, Neill C., and Frank J. Taylor. Southern Pacific: The Roaring Story of a Fighting Railroad. New York: McGraw-Hill Book Company, Inc., 1952. Athearn, Robert G. Union Pacific Country. Chicago: Rand McNally & Company, 1971. Davis, John P. The Union Pacific Railway: A Study in Railway Politics, History and Economics. Chicago: S.C. Griggs and Company, 1894. 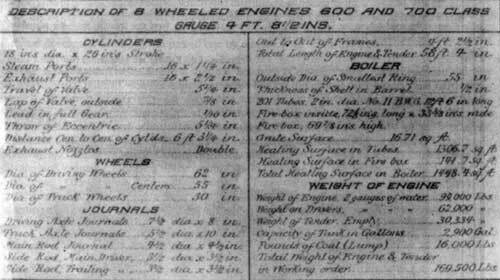 Diagrams of Engines, Union Pacific R.R. Omaha: Union Pacific Railroad, 1911, revised Sept. 23, 1911. "Doings at the Museum." Steamtown News (1970). Guide to the Steamtown Collection. Bellows Falls, Vt.: Steamtown Foundation, n.d. (ca. 1973), Item 25 and roster. Klein, Maury. Union Pacific: Birth of a Railroad, 1862-1893. Garden City: Doubleday & Company, Inc., 1987. _________. Union Pacific: The Rebirth, 1894-1969. Garden City: Doubleday & Company, Inc., 1989. Kratville, William, and Harold E. Ranks. Motive Power of the Union Pacific. Omaha: Barnhart Press, 1958: 32, 255, 305. A List of References to Literature Relating to the Union Pacific System. Newton: Crofton Publishing Corporation, n.d.
McCague, James. Moguls and Iron Men: The Story of the First Transcontinental Railroad. New York: Harper & Row, Publishers, 1964. Poor, Henry V. Manual of the Railroads of the United States for 1883. New York: H.V. & H.W. Poor, 1883: 805-806. Trottman, Nelson. History of the Union Pacific: A Financial and Economic Survey. New York: August M. Kelley, Publishers, 1966 (reprint of the 1923 edition). Union Pacific Locomotives & Tenders, Folio 200. Omaha: Union Pacific Railroad, Office of the Superintendent, M.P. & M., n.d.
"Upon Display: Union Pacific Steam in Existence." Locomotive & Railway Preservation, No. 8 (May June 1987): 26-27. White, Henry Kirke. History of the Union Pacific Railway. Chicago: The University of Chicago Press, 1895. Butler, W.E. Down Among the Sugar Cane: The Story of Louisiana Sugar Plantations and Their Railroads. Baton Rouge: Moran Publishing Corp., 1980: 175-177. "Steam News Photos," Trains, Vol. 25, No. 6 (Apr. 1965): 14.